GoPro has announced the Hero 6 Black as its latest flagship action camera, and as we predicted – and as was rumored – it can shoot at 4K resolutions at a silky-smooth 60fps. While many cameras can shoot at Ultra HD resolutions (3840 x 2160), ones that can do so at a high frame rate of 60fps are few and far between. The fact that some massive DSLRs, like the Canon 5D Mark IV and Nikon D850, can only shoot at 4K up to 30fps is a testament to the Hero 6 Black’s capabilities. Aside from it being an headline-grabbing feature, users will find the higher frame rates helpful when they want to slow down footage and show action happening frame-by-frame. If users want super-slow-mo footage, the GoPro Hero 6 can also shoot at 1080p and 240fps. These higher frame rates arrive thanks to GoPro’s new custom-made GPI image processor, which also improves image quality with enhanced video stabilization, a wider dynamic range, better low-light performance and a new digital zoom feature. 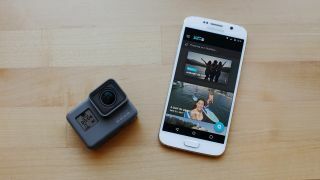 GoPro also claims users can expect 3x faster offload speeds to their phone over its 5GHz hosted Wi-Fi connection. Lastly, the Hero 6 Black is more rugged than every and can even go underwater up to 33 feet without a special waterproof housing. The GoPro Hero 6 Black is available now for $499/AU$750 (about £370). The GoPro Hero 6 Black is also fully compatible with the Karma Drone and Karma Grip. The GoPro Karma Drone is getting two new features. There's a long-coveted ‘Follow’ mode, in which the drone homes in on the Karma Controller’s GPS signal and follows the user wherever they go. ‘Watch’ is a simpler follow mode, in which the drone simply hovers in place and rotates to keep the Karma Controller in frame. Keep in mind that the GoPro Karma Drone has no obstacle detection capabilities, so you’ll want to be mindful of exactly where the drone is following you to. Other new Karma updates include an expanded Cable-Cam auto-shot path and 'Look Up' camera tilt capability.